All bank accounts belonging to Venezuela's diplomatic organisations based in the US have been frozen by Washington, Venezuelan Ambassador to the United Nations Samuel Moncada said on Wednesday. "All our accounts are frozen, we don't even have a possibility to pay salaries to staff," he explained. Addressing the terms of the work of Venezuela's diplomats based at the UN headquarters in New York, the envoy said that US authorities are hampering their operation and this violates the international obligations of a host country. Moncada also stressed that the Venezuelan diplomats are restricted in terms of movement in the US — they are only allowed to go on trips of up to 25 miles away from New York. "The time has come for the United Nations to recognise interim president Juan Guaido as the legitimate president of Venezuela and seat his representative in this body," Pence said in his address to the UN Security Council. In addition, Pence stressed that Washington has a draft UN resolution, and the US is seeking its official endorsement from all countries. "The United States is preparing a resolution recognising the legitimacy of the government of interim president Juan Guaido, and today we urge every member of the Security Council and all UN member states to support this resolution," he said. 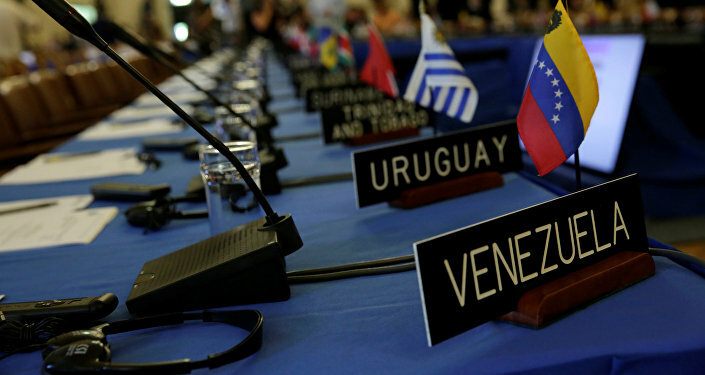 The UN diplomats cited by Reuters, for their part, stated that there was a high chance that the United States resolution on Venezuela, which has already been drafted by Washington, would not be supported by the organisation. The political crisis in Venezuela began in January when US-backed opposition leader Juan Guaido proclaimed himself Venezuela's interim president. Maduro, supported by China and Russia, among others, accused Guaido of plotting to overthrow him with backing from Washington.